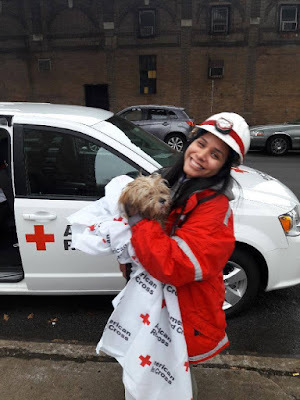 Disaster Responder Esmeralda Herrera caring for a family's dog from an apartment fire in Brooklyn. Over the last 7 days, the Greater New York Red Cross provided emergency assistance to 58 adults and 26 children following 36 local disasters. Here are some highlights from last week and a preview of upcoming activities (see below). Over the weekend, Long Island Red Cross Volunteers, including Board Member Jonathan Goldstein, installed altogether 126 alarms as part of our Sound the Alarm Campaign! On Friday, we partnered with JASA and Councilwoman Margaret Chin to provide hands-on emergency preparedness training to NYC seniors. Thursday afternoon, Red Cross Disaster Responders assisted a family of 2 adults and 2 children with emergency housing, as well as had assisted to transport their dog to a local animal shelter. That morning, Assemblyman Richard N Gottfried was honored by our chapter for his continuous support! Continuing with our ongoing #MyRedCrossLife Instagram series: last week we featured Disaster Responder Ken Richardson who discussed about his first volunteer experience with the Red Cross at the NYC Marathon. On Wednesday, Daily Point of Light honored Red Cross Volunteer Vivian Moy for her extreme dedication to serving others in her free time! We congratulated Fred Leahy for his 20 years of humanitarian service to the Red Cross. Monday morning, volunteer photographer Kevin Suttlehan captured Red Cross Disaster Responders assisting 17 adults and 7 children from a 2-alarm fire in Brooklyn in this photo series. The Bay Shore Boy Scouts and their families hosted a bleeding control training, utilizing our very own tourniquet and bleeding control kits! We are actively recruiting for the following volunteer positions: Volunteer Screener, Home Fire Campaign Team Member, Disaster Action Team Member, Recruitment Support Member, Recovery Caseworker. Apply today at www.redcross.org/volunteer! For more information, please contact recruitmentgny@redcross.org. Feb 12, 15, 18: Red Cross blood drives will take place from 2 to 7 p.m. at the Greater NY Red Cross building located at 520 West 49th Street, Manhattan. Schedule an appointment to donate today! Feb 18: We are holding a 2-hour class on the history of the Fundamental Principles of the Red Cross and Red Crescent Movement (10 a.m. to noon).The course will take a close look at these humanitarian principles as well as the history of the movement this past century. Feb 28: The Studley School of International Affairs is hosting a conversation entitled, Becoming Humanitarian: The Making of an ICRC Delegate (6 to 8 pm.). The discussion will feature former ICRC delegate and current fellow at the New School for Social Research, Monique J. Beerli.